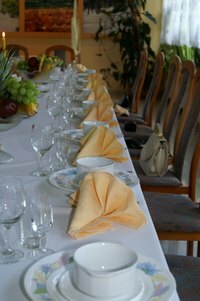 Dinner parties provide an opportunity for attendees to enjoy a meal and converse in regards to the latest goings-on in each other's lives. While eating and conversing may offer enough entertainment for some guests, others may be in the mood for more exciting entertainment. Aside from traditional party games, dinner party attendees can play a variety of games to enhance their social-gathering experience. Guests form a chain of like-lettered famous names in this game. After the first player says a celebrity name, the player to his right says a name starting with the first letter in the previously named person's last name. Play continues around the table in this manner. If a player uses a name containing the same letter in the first and last name (for instance, Ryan Reynolds), the game reverses direction around the table. Players take a sip of their drink as "punishment" under the following circumstances: having no answer; missing a turn; pausing; speaking out of turn; or, using a previously used name. "The Memory Game" requires players to memorize items that other players brought to a party, adding their own in the process. For example, if the first player says, "I went to a party and brought a bouquet of roses," the next player repeats that statement and adds adds another item. Play continues in this manner, with guests reciting every previously named item and adding their own. Players exit the game if they cannot recite the whole list. The last player remaining wins. Guests try identifying funny, peculiar phrases when playing "Message Under a Plate." The host puts one slip of paper containing a different phrase under each dinner plate. Before eating dinner, guests read the card and try using the phrase or question as naturally as possible in conversation. If played as a race, the guest using her phrase last loses. If played as a competition, the guest who uses her phrase without anyone noticing wins. The dinner party host tries putting the freeze on guests in this game. Early in the evening, the host designates one guest as "Mr. Freeze." At some point in the evening, "Mr. Freeze" completely freezes. Other guests eventually notice and also freeze. The last person to notice that everyone has frozen in place loses. If played as a drinking game, the last person to notice everyone has froze downs the rest of her drink and becomes "Ms. Freeze." The host creates a deck of 20 or so "Never Have I Ever..." statements, and has one player pick a card from the deck and read it aloud. Players who have done the "Never Have I Ever" take a sip from their drink and must elaborate on their experience if another player asks. Play continues until all guests have asked a "Never Have I Ever" question. After ensuring that no guest has a peanut allergy, the host empties a bag of peanuts onto a plate and gives each guest a drinking straw and mug. Using only the straw, guests try getting as many peanuts into their mug within 1 minute. The guest with the most peanuts in his mug wins. Guests try figuring out their own "identity" when playing "The Sticky-Note Game." The host writes the name of a famous person on a sticky note, sticking it to the forehead of one guest. The "Sticky-Note" guest asks yes or no questions to other guests; upon guessing her identify, the "Sticky-Note" player makes a sticky note and sticks it to another guest's forehead.